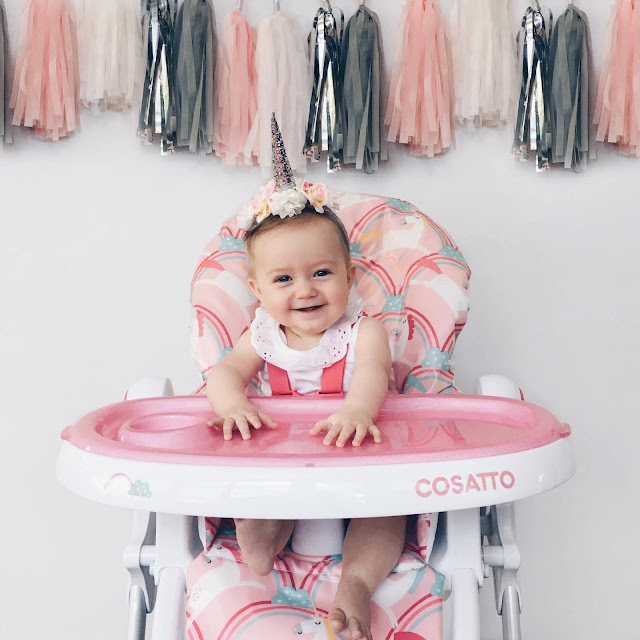 When our favourite baby brand cosatto asked if we would like to review the Noodle Supa highchair my head literally hit the ceiling whilst jumping for joy! 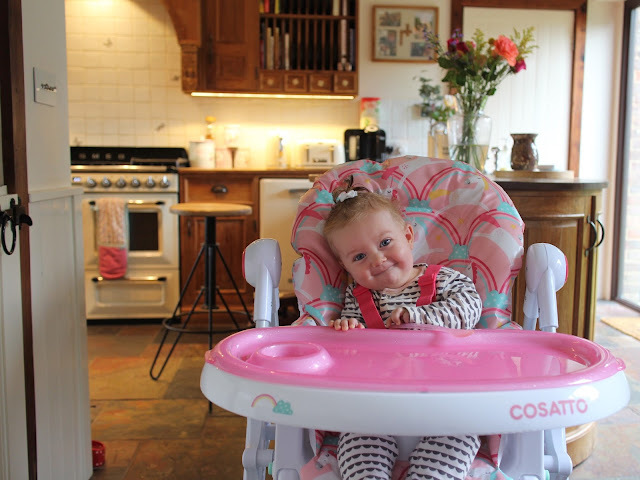 We have, up until now, been happily using 'that' famous IKEA high chair which is a firm favourite on the mum sites. Although as Lylie fast approaches the big 12 months, at lightening speed, I am aware her chunky little legs are due an upgrade. As standard practice with Cosatto you are spoilt for choice with patterns and designs. 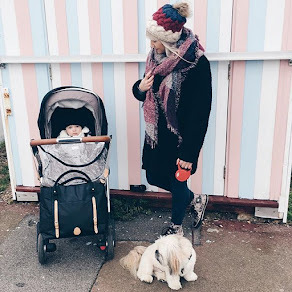 It will be little surprise that I instantly gravitated towards the unicorns, we always get so many compliments on our amazing unicorn encrusted pram I decided to stick with the theme...although my head was nearly turned by the egg cups. 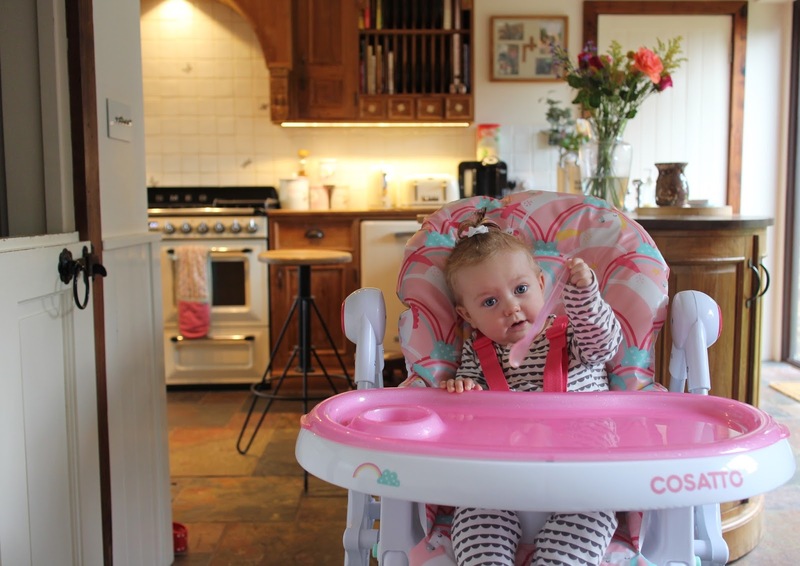 One of the key features of the Noodle Supa Highchair is the removable easy clean extra comfy cushion, you could definitely forgive your bambino for taking a nap during dinner as it's so squishy. I feel like I am spending my whole day either feeding Lylie or cleaning up the mess so this being removable is a instant time saver when it comes to wipe down time. I didn't realise when selecting my unicorn print that the tray was glittery GLITTERY. I am such a magpie and this was such a wonderful surprise when I opened the box I squealed with excitement. Apart from the tray being the most beautiful thing ever it's easy pop off design makes clearing up a much simpler process. Although if a wet wipe goes anywhere near Lylie you would think it was Armageddon, anyone else's little one think a wet wipe will kill them? During the weaning process everyone will tell you how important it is for you to eat with your baby. It isn't always possible, especially at dinner time, but at lunch time I always try to have a meal with Lylie. The six point chair height adjustment and removable tray means we are able to easily sit up the table together without Lylie feeling like she is an add on. She does seem happier when we are sat together eating the same food, like a big girl. I hadn't even thought to do this until I received the Noodle Supa Magic highchair so that has been a huge benefit for me. As beautiful as this highchair is I don't always want it to be set up, the easy collapsable function ensures that it is easy to store away. If you have a fairly small space to work with the Noodle Supa will still suit you, it really is both practical and stylish. We couldn't be happier with our newest Cosatto product... easy clean, comfortable and supportive what move could you want? Why is it so hard to shift the baby weight? © Across This Page. All rights reserved.